Buying stuff in large quantities apparently makes me happy. Imagine me very happy having returned from a trip to Costco. Although, even large quantities of reading glasses are not enough for me. In the last 2 days I misplaced two pairs. Alas, my Costco shopping might have reached its peak. I just got notice from my doctor that I can quit the Coumadin. No more biweekly Coumadin checks anymore for this woman. Instead I’ll come up with other age related problems. Shoulder problems. They are especially painful, right after lower back pain on the Marianna pain scale. Whereas my kaiser doctor recommended I see a chiropractor for my back, he did say he can help with the shoulder. After a painless injection of cortisone, and armed with papers for exercises, I’m hoping for the best. Add: Some happy pills for the pain on the way home and lest I forget, a trip to the yarn store and some extra yummy universal wisdom yarn called poems in my little hands. I did degrade the environment a bit by buying large quantities of plastic bags to keep my yarn stored. Somehow I’m starting to fear moths. Though apparently from the 15,000 species of moths, only 2 devour animal fibre. I wonder, do they attack sheep for their wool? 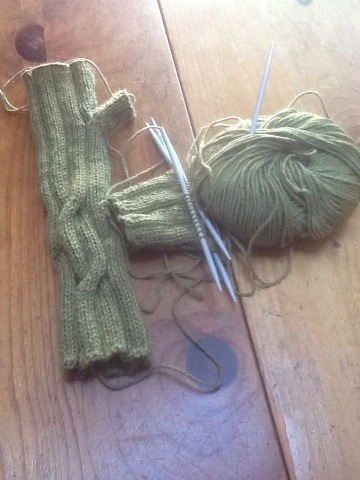 And to show you that I’m no slacker, here are the fingerless gloves I’m working on for Stephen. Told you, no slacking here. I did not get to do much knitting yesterday while out in the world. Short waits everywhere. No, I’m not complaining, just observing. My friend does like her socks. They were just about the right length, a bit more and I’m ready to decrease. And then the other sock. I find it amazing that anything can grow visibly with number one needles. But socks re that way for me. 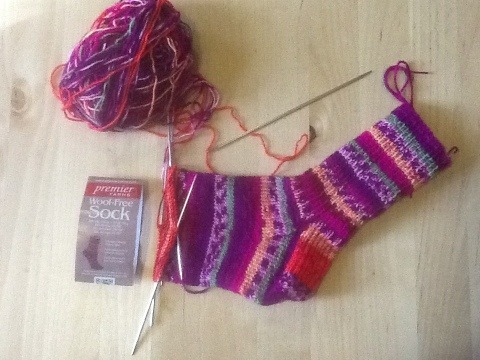 Just when I’m about to complain and grow tired of the pattern, the colors, I’m at the tip of the sock. Of course there is another one waiting for me. In the meantime I’m knitting the second sock so Stephen has another pair. Last night I noticed the possible cause of my shoulder problem. I read in bed, books and ipad. Holding all with my left hand, so perhaps the left shoulder problems stem from that little habit? Maybe it’s time to change places with Stephen in bed. Today is a successful day. Partway done with taxes. But knitting calls. Especially the poems yarn. Making myself some fingerless gloves. I just developed my first pattern. I knit during the week, walk to the yarn store on Saturdays and rest on Sundays with potluck with friends and a couple of episodes of Carnivale. While walking to the store I imagined that I could get more yarn and not feel guilty because, really, I’m burning calories, serious calories on the walk partially uphill. How this is related to buying guilt-free yarn still needs to be worked out. I’ll keep you posted. The most exciting aspect of having children is that they turn out to do miraculous stuff you never dreamed of and you get to be proud of them. But the next best thing with these children is when they step in your foot steps. My daughter lives in Denver, a couple of states over from our lovely California. Yesterday she announced that she will take up knitting again. I told her to refresh her memory with a scarf she started years ago in knit, and to refresh her purl method. Then I’ll help her with the hat she found on ravelry. I was dancing around the house I was so happy. 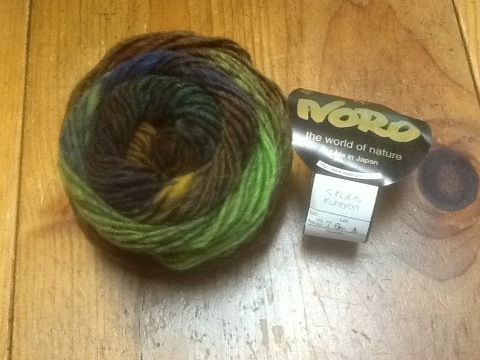 And today I picked up the perfect noro yarn for the project. The hat is for boyfriend and he likes green. Needles are to match the project and I was very tempted to go with the much cheaper Hiya Hiya needles. But then could not resist the addi turbos, my favorite. I find the Hiya Hiya needles too light. I want a little substance but not super heavy. Everyone has their opinion on needles, I’m an addi girl woman and occasionally will consider wood or bamboo. On to Ben Franklin where they had a wonderful but pricy Cascade Casablanca yarn. A good thing none of the colors called my name. 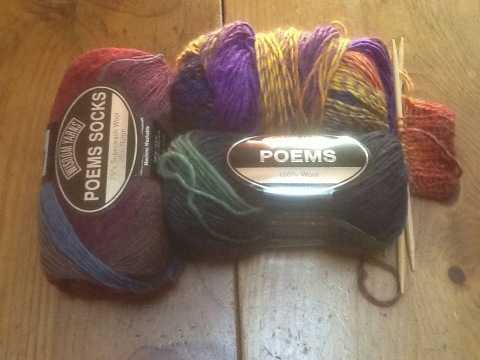 Both stores I visited today did not carry poem from universal yarn. I would so like to fondle a skein or two. Yes, I’ve read queerjoe’s blog this morning. For the rest of this day I will beat a pair of fingerless gloves for Stephen into submission. I did not get to bed until after 3 am this morning in sympathy with my lawyerly husband who was working on a deadline. But wee hours are no time for new patterns. Here is the Dashing pattern at Knitty. Apparently there is trouble ahead with the thumb thingie. I was afraid to read the more detailed instructions, just charging ahead as usual. Last November after I came home from a 20 day hospital stay after a massive heart attack, quadruple bypass surgery, and a pulmonary embolism I decided to finish all my started knitting projects and knit a sweater for Stephen. I looked through every bin and basket and finished tons of socks. Since socks go missing in the wash I must have thought why knit the one that gets lost anyway, save myself some time. Well, it doesn’t work that way. 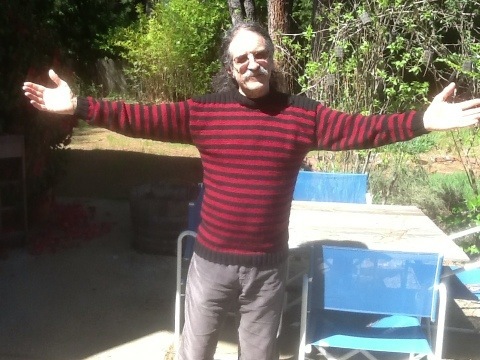 I also made a sweater for Stephen to replace the ones I made 20 plus years ago with arms that stretched to the floor by now, or arms that never stretched, and other imperfections. I did good. Though I avoided major unfinished projects. There is a cardigan I made for myself. All it needs is seaming together. That’s my, well, what’s the word here? Let me just say, I might be in a nursing home or dead before this thing will be finished. Now I do have a friend who offered to do it for me, but I’m stubborn, and also see it as a teaching opportunity for myself. Plus, I’m a control freak. If that means, I’ll never wear this thing, so be it. But I digressed. I need to acknowledge here that in four months I managed to produce more unfinished objects than I finished. Part of this is Stephen’s fault. He had to get me a gift certificate for my local yarn store. Did he not know what that would lead to? Does he know me so little after almost 33 years? Or does he care so little? Well, in that case…. Last evening, Thursday evenings, when a few of us get together and knit, I finished knitting the man purse. Actually, I ran out of yarn and was too lazy to get up and get some more. It also looked big enough. For now I’m holding out on the felting as there are other projects that need felting and finishing first. Let’s do them all together. During my recovery I had a friend who checked in on me daily by phone. She even cooked some meals for us. So I decided to knit a pair of socks in gratitude. Turns out, her house is full of cloth moths and she refuses to use anything toxic. Did you know that of the over 15,000 types of moths only two devour animal fibers? Well, she has them and can’t use anything with wool in it. A sock out of cotton? How about acrylic? I’m a sort of yarn snob, but even in the unmentionable fibers I found nothing suitable. That’s when it happened. Checking out a tiny, packed to the ceiling craft store, I saw a yarn that read wool-free sock yarn. It must have been the psychedelic neon colors that drew my attention. What was I supposed to do? Miss my one chance of paying back my friend who once mentioned she loves colorful socks? This picture does not do justice to the screaming colors, but you get the idea. I will only be knitting one and then get her opinion before I continue. There is some wool yarn that has been stalking me for years after my love affair with it has long gone. 20 plus years later I gave up on ever making the kids little coats. I did not know at the time they would be in their 20s by the time I got around to actually using the yarn, so I had bought way too little. My go-to item for thicker yarn of which I only have a small quantity is a hat. Now that my repertoire has expanded it might include fingerless mitts. But a few years back a hat it was. There was enough to make many hats but I limited myself to two. Son Toby never wore his and eventually returned it. Husband Stephen was much nicer about it but eventually also complained about the itchiness of the material. Earlier this year I’ve tried a man shoulder bag that I frogged yesterday and started over. This time it’ll be a felted man bag. But it might have different dimensions from my intentions. I know that felting can change a lot, but this bag is too wide to keep hope alive. I could sew it sideways for a different bag, wider than tall. It is the fashion now, right? Or I will give up and throw or give the yarn away. Here is a picture of my latest attempt. Good intentions and all, I just can’t get in the habit of writing this blog. The knitting seems to get in the way. 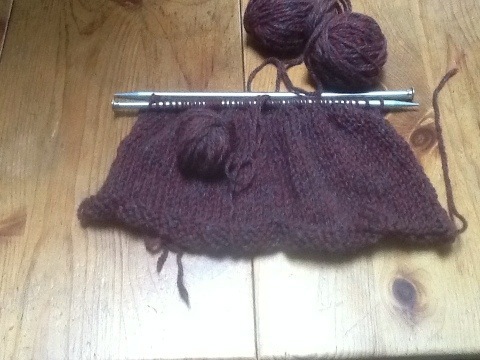 Having finished a sweater for Stephen yesterday I find myself at a loss for a new ‘big’ project. You know, the one I get to buy tons of yarn for, plan, find a pattern, plan, find the right colors, plan, find the yarn, plan…. For now I’ll settle on socks and fingerless gloves etc. little projects. I don’t have enough friends that need fingerless gloves. It has been way too warm in Northern California. If this is a hint of climate change to come, I fear for the knitting industry here. The pattern of the sweater in the picture has been haunting me for a while. It’s simple, but it was speaking to me, loudly. 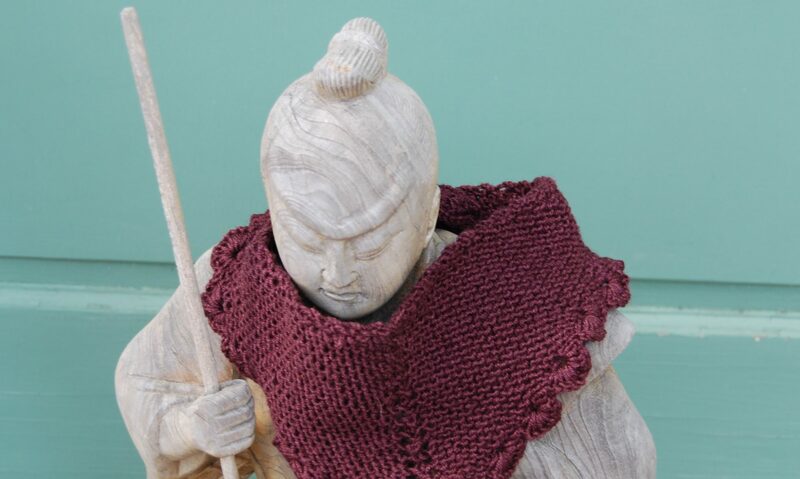 There is another pattern from a book of Japanese knits I believe that is screaming out loud to be knitted by me. If only I could remember the book…. This is what happens, I’m in the store with Stephen browsing knitting books, finding a pattern or two. I will ask him to write down the name of the books, Stephen is very handy that way, always ready with pen and a tiny piece of paper and tiny handwriting. I would have to search for my glasses first, ask someone for paper and pen, and never find it again in my purse. Stephen has all these little papers in his pockets and ready for me when needed. Except when he releases these papers to me and they are tiny and oh so hard to find again. Why don’t I buy the books? If there is only one pattern I like it seems sort of an expensive adventure. I look at our library first, then if I find something like it on ravelry. This system works pretty well for me. I have knitting fever. Am in a knitting frenzy and am wondering how long that can last. As fast as I pick up an activity and totally immerse myself in it, I can move on just as fast. But knitting has been with me most of my life, and so has my stash of yarns.